Eyes filled with sun, stars and distance. In good magical-realistic fashion, when none of our international sim-cards allowed us to make phone calls in Lesotho or connect to the internet, we should have realised that we had not just crossed a border. We had, in fact, gone back in time. Way back. We didn’t realise it, not yet. But let’s start where we had left off. We were in Ladybrand in what had once been called Orange Free State and is now just Free State. Ladybrand is a small town that may well owe its relative prosperity to its proximity to the border with Lesotho and its capital, Maseru. There was a surprising number of well-stocked supermarkets, which led us to wonder if we should stock up on supplies before crossing the border. 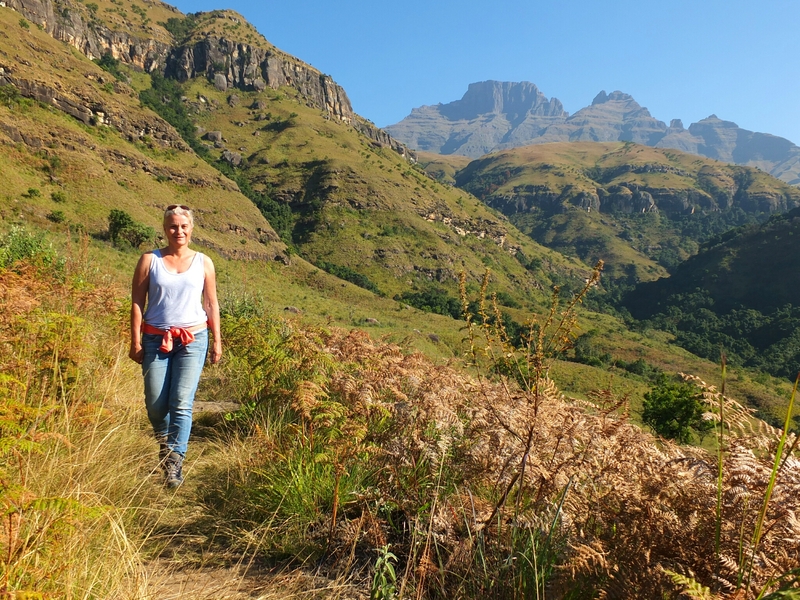 But Charlotte looked up the customs regulations and found that importing plants, dairy products and meat into Lesotho was prohibited, and that the duty-free allowance of wine was two liters per person. We decided to fill both our tanks with diesel, just in case, see about buying groceries on the other side of the border, and just take a gamble with the wine we still had left over from a shopping spree in Paarl. We approached the border and stopped behind a lorry (truck), thinking that was the end of the queue (line). Two men in uniform walked past, looked at us bemusedly and motioned for us to drive around the lorry, and when we did, we saw it was simply parked there, effectively blocking the only lane towards the border, with no other vehicles ahead of it. We slowly moved on, past a checkpoint where no one was checking, and that was all for the South African side of the border. Then on to the next checkpoint, where again no one was checking, we continued as slowly as we could, looking left and right but seeing no reason to stop, and then… we were greeted by a sign saying, Welcome to the Kingdom in the Sky. Let’s dwell for a moment on that phrase, so beautiful in its simplicity. 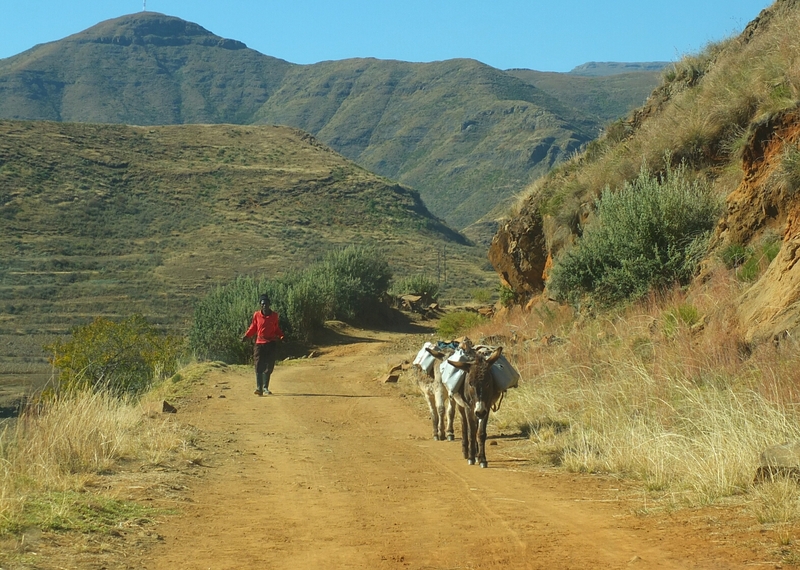 Surrounded on all sides by South Africa, the territory that is now Lesotho was pushed up higher than its neighbour by the geological forces that shaped southern Africa millions of years ago. Tremendous volcanic activity had caused a thick layer of lava to flow onto the southern part of the continent, which then gradually eroded away, except where it was covered by erosion-resistant dolerite (that explained the hundreds of ‘Table Mountains’ that we had seen all over South Africa!). 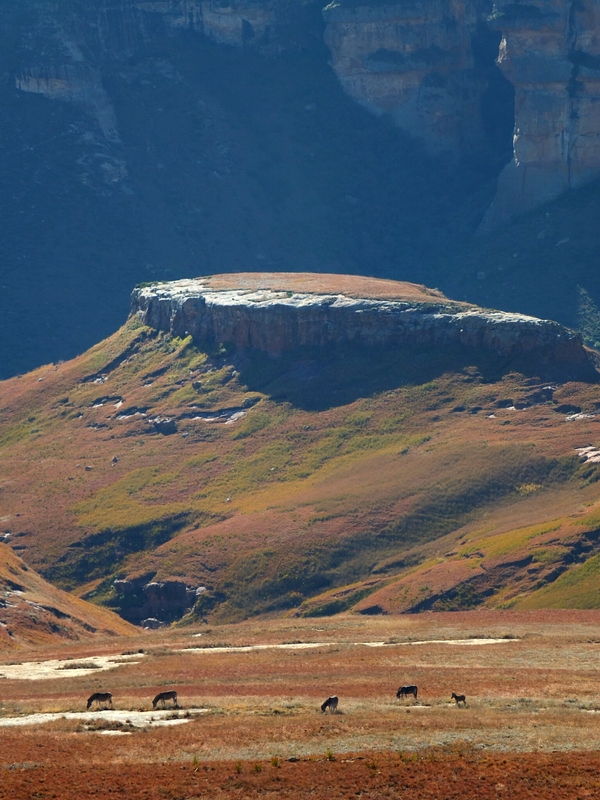 The central plateau was then pushed up, creating what is called the Great Escarpment: the boundary between the high plateau and the coastal plains, which is most obvious at Lesotho’s eastern border with the South African state of Kwazulu Natal. In fact, after gradually climbing as we progressed through Lesotho, and then descending into Kwazulu Natal, we would see the escarpment that forms the border from the Kwazulu Natal side, not as a series of peaks and valleys, but as one long, contiguous wall that looked impenetrable and has, indeed, only one pass that can be crossed by vehicles into and out of Lesotho: the 3200 meters high Sani pass. The Kingdom in the Sky really is an altitudinous state. 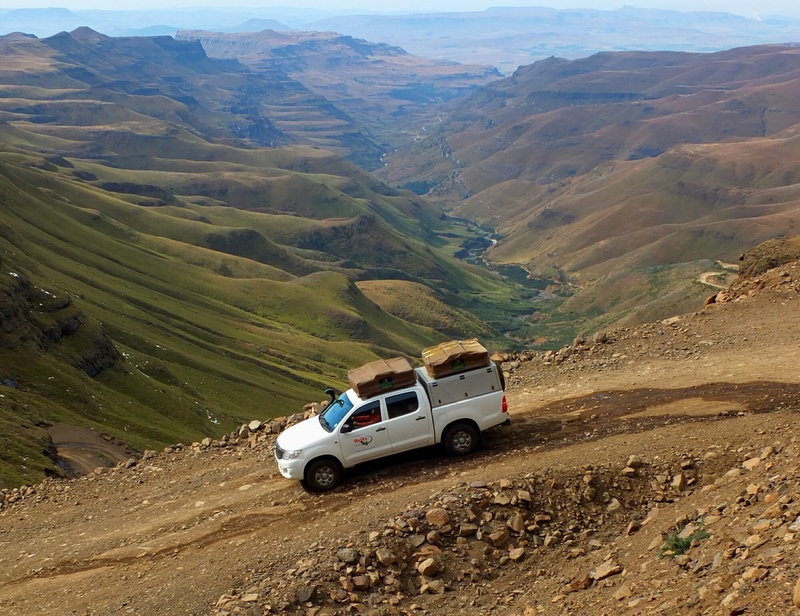 Our plan, then, was to enter Lesotho from the west, traverse the country and exit via the Sani pass. We could not afford to stay for more than a few days, because now, in winter, any snowfall would make the road impassable for several days, and we had a little over a week left to return the car to Johannesburg. Stopping for supplies in Maseru, the city centre struck us as livelier, more colourful, messier and cosier than anything we had seen in South Africa. Markets, stalls, vendors caused a pleasant shock of recognition; I was reminded of Asia for a moment, but no, of course, this was Africa. The shopping done, we left the city in a southeasterly direction, without a plan, and initially just toured and took in the countryside until we found a place to camp. 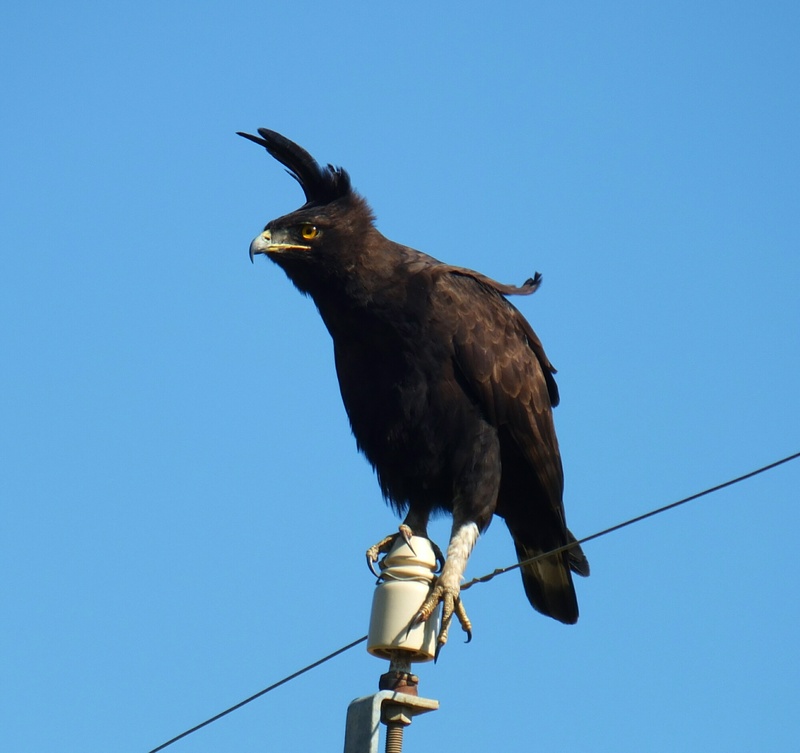 It was immediately obvious that we had arrived in a very different country, although the extent of the differences would take some time to sink in. 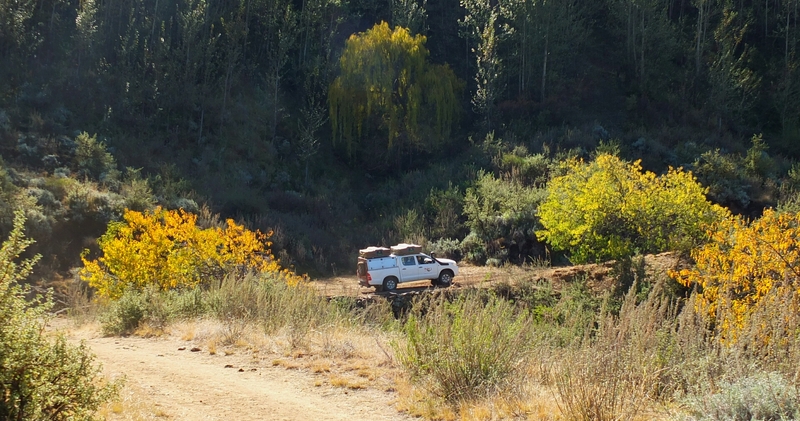 The following day we turned around and, acting on a whim, turned onto a gravel road that would take us to the God help me pass on the A3, which is one of two roads that connect the capital with the approach to the Sani pass. The gravel road soon turned into a 4×4 trail that took us through a beautiful countryside where not cars but horses and donkeys were the prevailing mode of transport, while many people simply walked. People gazed at us where we passed, some waved and smiled. We waved and smiled back, and marvelled at the colours around us, the landscape that changed with every turn. We tried to speak with a shepherd, in vain, but he smiled a lot and burst out laughing when I showed him a picture I had taken of him. The pace at which we travelled became more relaxed than it had been, of necessity because of the road conditions, but also because there was no reason to rush. We stopped often, taking in the views, feeling calm and happy to be there. 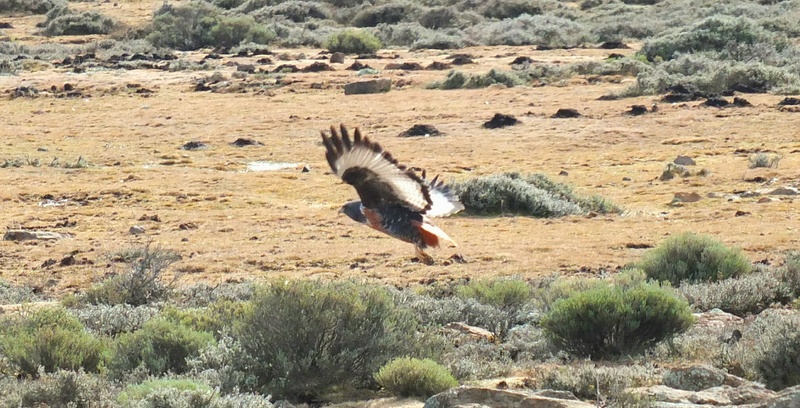 For a few days we kept progressing slowly eastbound, and even the A3, which had been paved near the capital, turned into a gravel road and finally, at the Menoaneng pass which doesn’t share the Sani’s fame but is nevertheless situated at 3000 meters altitude, into a winding 4×4 trail that the low, bright sun made very difficult to navigate. The further east we came, the higher we climbed. The days continued to be pleasantly warm as long as the sun was above the horizon, but the nights became colder. After sundown, we would marvel at the stars for a short time and then hurry into our sleeping bags. By eight o’clock, if not earlier, we would be fast asleep. In South Africa, the temperature had dipped below freezing at night a few times, but in Lesotho, this became a common occurrence and in the morning, we regularly found our water supply frozen. With the higher terrain, the vegetation became sparser, although small flocks of sheep or goats could still be seen. 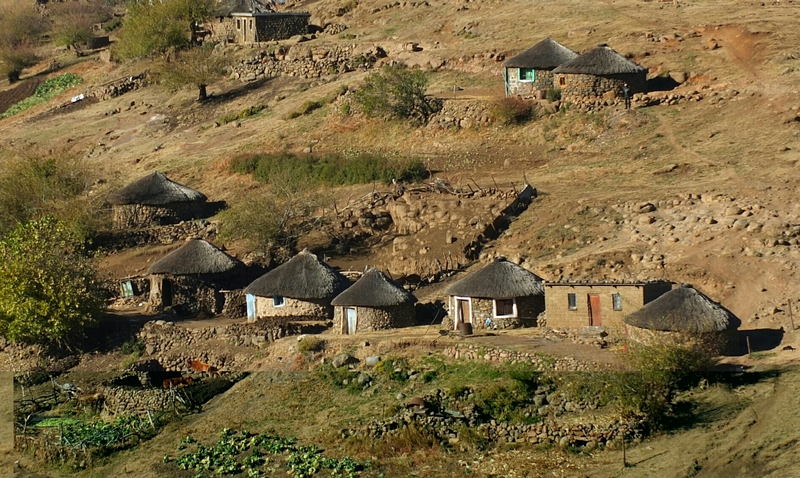 Here and there the rondavels, small traditional round dwellings with thatched roofs, and children and women calling out to us: give me something! Lesotho is a poor country. Most of the population lives below the poverty line. In spite of that, the people seemed content with the life they are living, a life that hasn’t changed for centuries. The difference with South Africa struck us. In South Africa we had driven through and stopped in towns where San, also known as bushmen, form the majority of the population. Traditionally, they had been hunter-gatherers, but there is nothing left to hunt (all the land belongs to people who have put fences around it, and when the San stole or killed cattle from the people who had put up the fences, they incurred the wrath of those same people who then organised ‘disciplinary’ expeditions in which hundreds and thousands were killed), and there is very little left to gather. So the San now live in towns, and it is a desolate sight: men standing by the side of the road with nothing to do, all day. There are always more of them gathered around the local liquor store than elsewhere, but even at the liquor store, there is no hope. 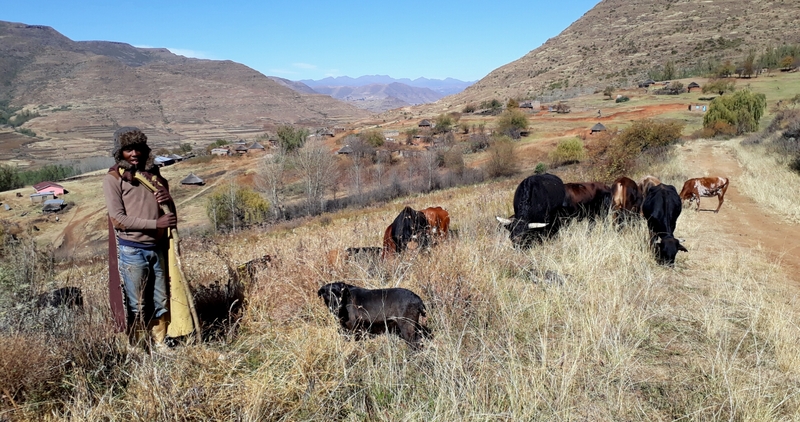 In contrast, most people in Lesotho have at least a few head of cattle and most grow some maize (corn). We were told that many eat twice a day: ‘pap’ (maize porridge) in the morning, some meat at night. Once in a while, someone undertakes the long journey to the capital to sell wool and goats and buy what is not normally available to them, in other words, anything else, since there are practically no shops anywhere in the country. It is a form of poverty, yes, it is the natural state of the subsistence farmer. It is not the poverty of the disenfrachised. 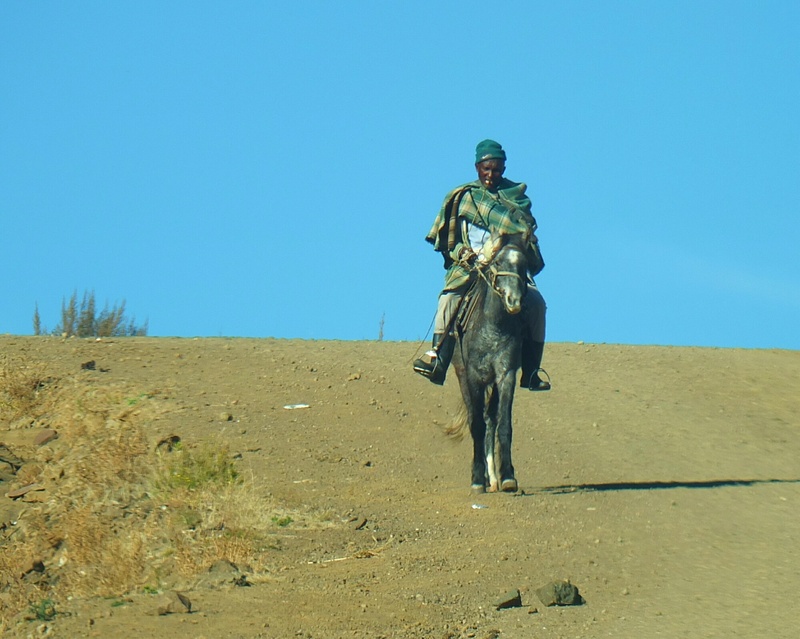 The people of Lesotho have always been the masters of their own destiny, however humble. Another thought: many whites in South Africa that we spoke to volunteered this information: the country is going down. It’s not, of course, and they’ve been saying it as long as we can remember. Basotho (people in Lesotho) will never say such a thing: like Asians, they smile about adversity, they giggle when embarrassed. They will not burden others with their problems or anxiety. Are these thoughts premature, after such a short time? Probably. They are only my thoughts, my two cents’ worth as they say. Don’t attach too much importance to them. 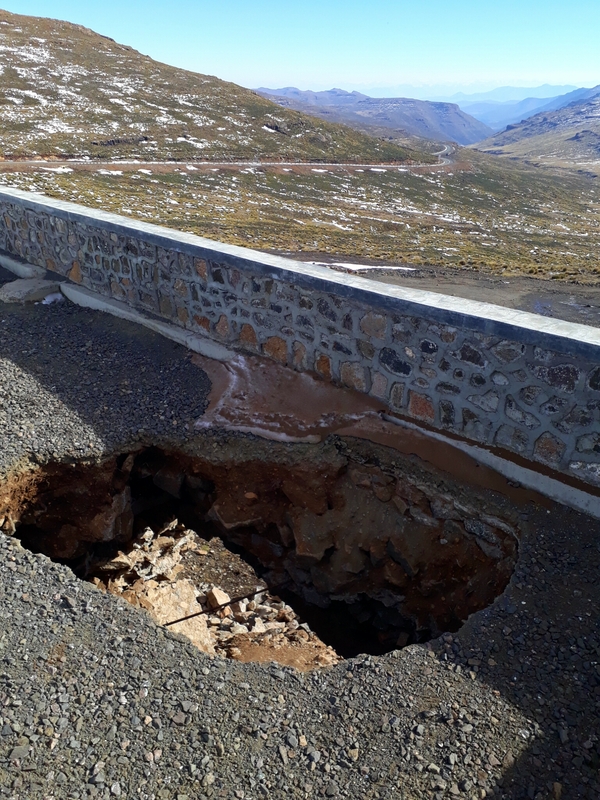 Much to our surprise, from Mokhotlong, where the A1 and A3 met and continued together as the A14 towards the Sani pass, the road surface was a perfect tar. 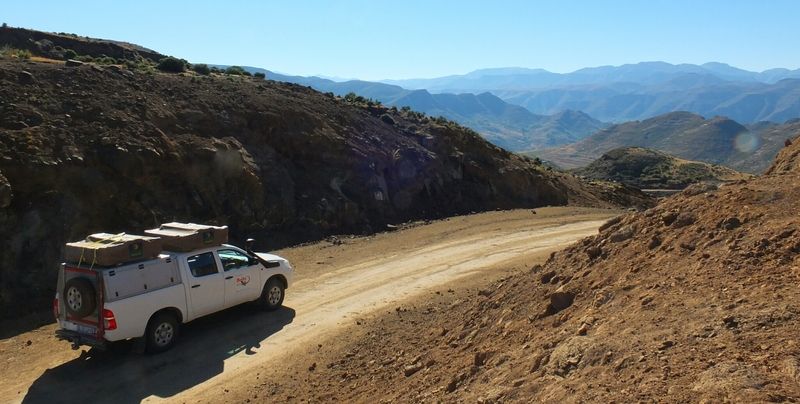 After the high point at 3200 meters, which, strangely, is not considered the pass, we crossed a plateau before reaching the Lesotho border post. I had been feeling uneasy about the way we had crossed the border near Maseru. Had we done the right thing? Should we have parked the car, got out and entered an office to do things with documents and stamps? Now, as we stopped for a padlocked gate that made any thought we might have entertained about ‘just driving past’ sound silly, my apprehension grew. We approached a counter where an immigrations officer accepted the documents we handed him, leafed through them, and then asked us with a look of what-am-I-missing, When did you enter Lesotho? Upon our reply he studied each of the stamps in our passports and after what seemed like a long time, stone-faced, he handed them back to us. We were free to go. We carefully maneuvered the car onto the ‘wrong’ side of the road, which was not closed, and slowly, so as not to upset anybody, drove off. There was indeed snow on the pass, which had fallen more than a week earlier, but it did not cover the whole width of the road. Right after that, the tar surface of the road changed into gravel, strewn with rocks, and the valley on the other side opened up. It was still a long way down to the South African border post but already, we enjoyed great views into Kwazulu Natal. 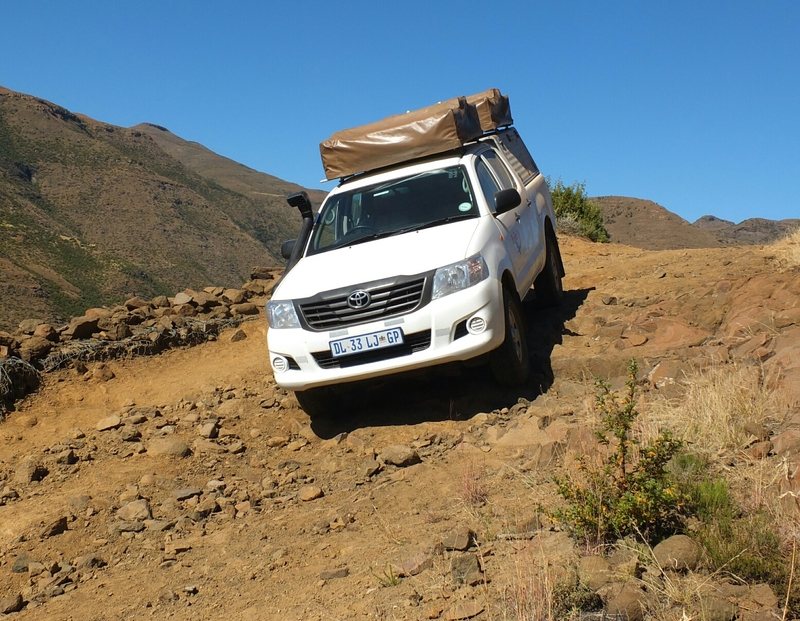 From the South African side, 4×4’s operated by tour companies came up with paying passengers who had booked a ride up the most famous pass in Africa. 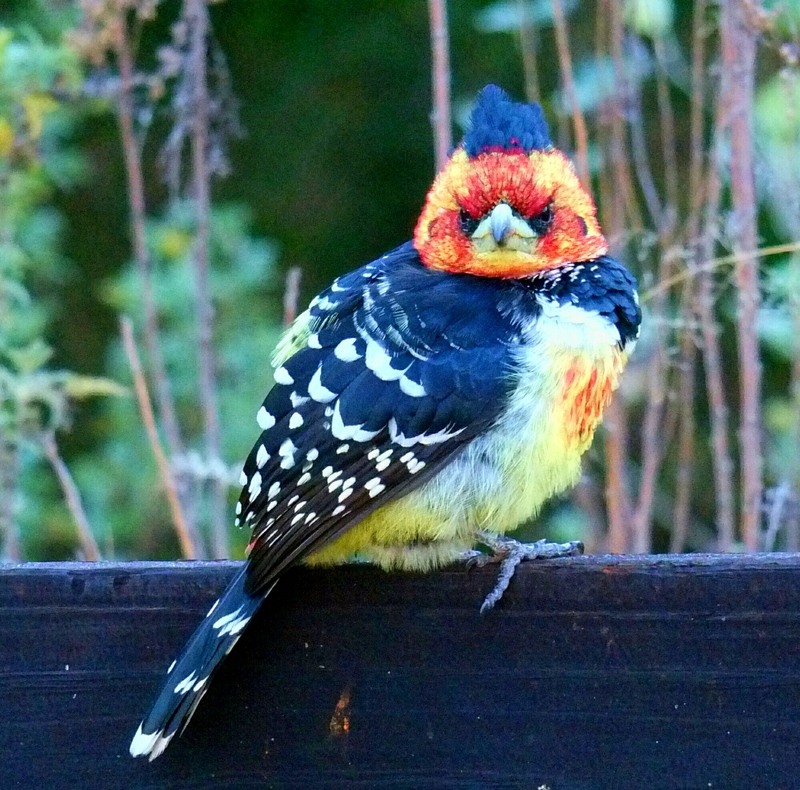 It was the first indication that we had slipped back through the time warp and had come back in South Africa. The South African border guard shrugged and gave us a new entry stamp. Back in South Africa: it was fences, gates, signs that threatened ominously with ‘armed response’. But also: a restaurant where we enjoyed a decadent meal on a patio, supermarkets that sold everything we could imagine, and more. Wealth in which we, the priviledged, could share. And I’m not going to lie: we enjoyed it. 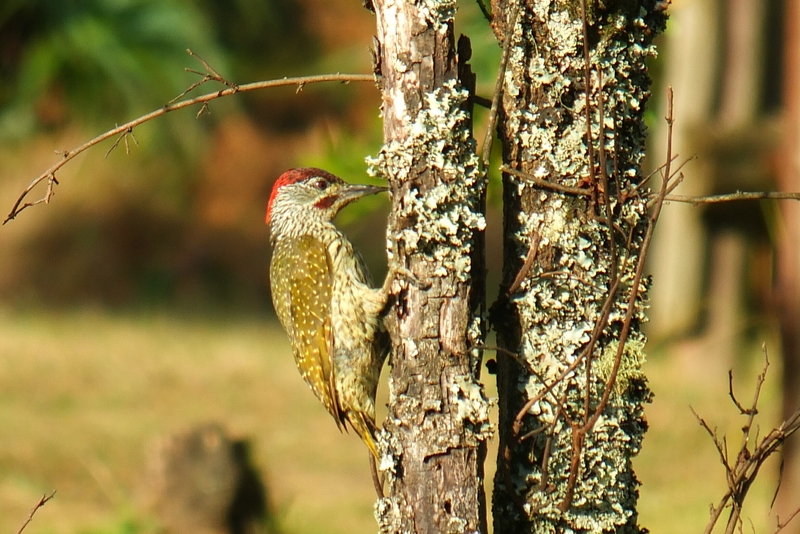 But memories of ‘the other side’, the beauty, the simplicity, still lingered. We stayed in the Drakensberg area for a few days: Highland Nook, Nottingham Road, Monk’s Cowl, Golden Gate Highlands National Park, did a few hikes, spent one last night on a game farm near Johannesburg where Charlotte startled a few gemsbok (oryx) when rounding a corner at the end of the campsite and then went on to photograph several rock hyrax that were lazing in the afternoon sun, and then, reluctantly, we entered the city to return the car. The city… Let me tell you one thing about Johannesburg: you don’t want to be there. 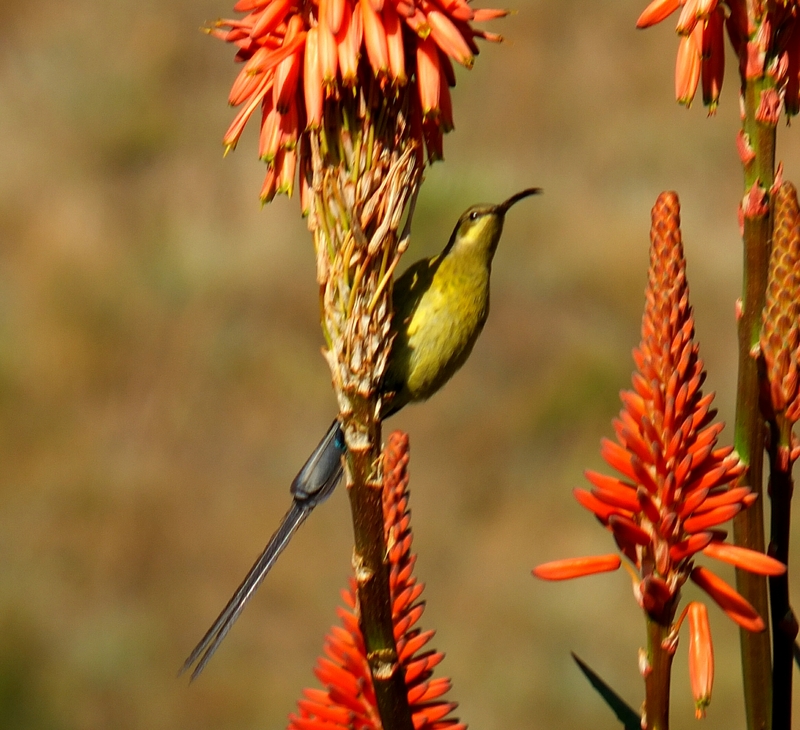 After a few weeks spent outside, eyes filled with sun, stars and distance and ears filled with silence, entering Johannesburg was a shocking experience. Being in a metropolis is bad enough, but to drive into it and be thrown into a dog-eat-dog environment with irascible, capricious, reckless drivers is something no one should subject himself to. Unfortunately, this was where we agreed to return the car, and where we will pick up the next one, which we’ll take into Botswana and Namibia. Fortunately though, the area where we are staying for a few days has some very, very good food options. Oh well. If you can’t have one thing, you can always indulge in another. Zebra grazing in Golden Gate Highlands National Park. 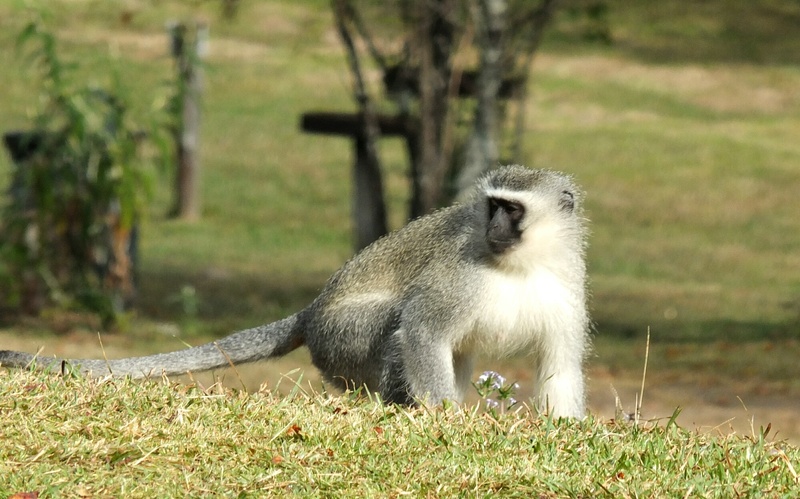 Vervet monkey waiting for us to turn our backs. 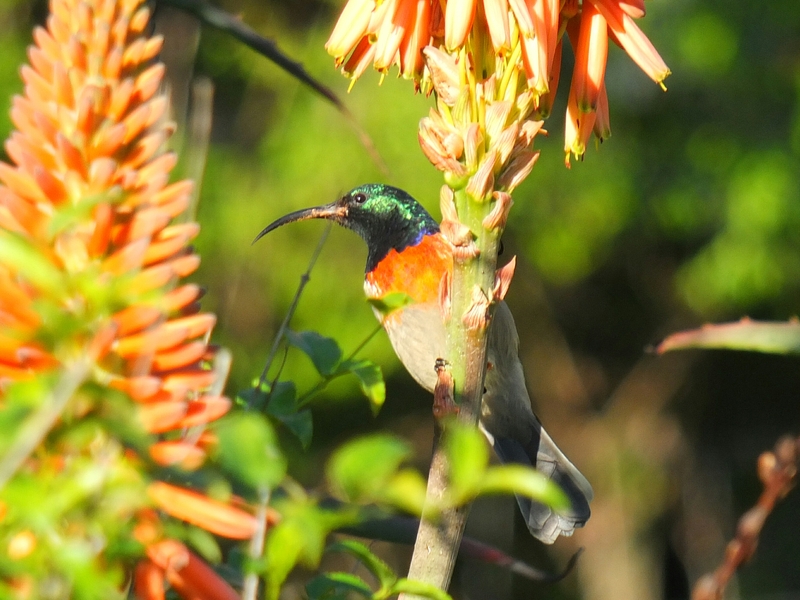 Malachite Sunbird, male, non-breeding (I think). In Reitz, camping by a lake. Charlotte took this picture at dawn. 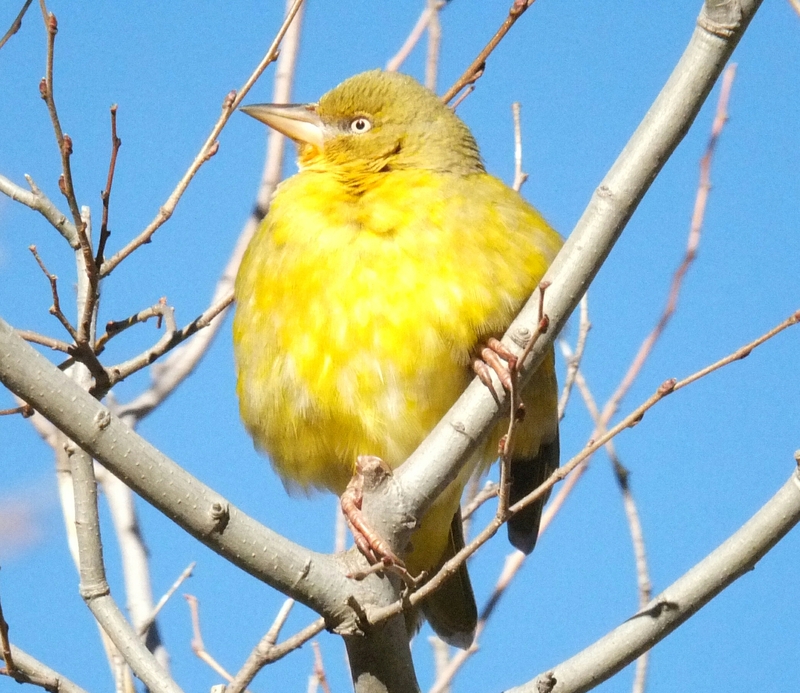 The bird photos are hers, too. Thank you Heidi, that’s kind of you. Will do! Sounds like you are having a fabulous experience. Your writing is inspiring!! Yes, we are really, really enjoying this. Still glad to hear you enjoy reading about it! Heerlijk! Ik ga er altijd even uitgebreid voor zitten met een kop thee binnen handbereik, om jullie avonturen te lezen. Zoals altijd zeer indrukwekkend en duidelijk omschreven. De enige vraag die bij me opkwam werd in de laatste zin beantwoord. Chapeau Charlotte!! Ze heeft ook sommige van de andere foto’s genomen, maar ik weet niet meer zeker welke.